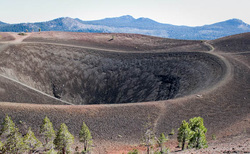 Come to Lassen Volcanic National Park and experience the largest plug dome volcano in the world. Located in the Cascade Range of northern California, this national park is one of the few places in the world where you can find all four types of volcanoes: plug dome, shield, cinder cone and stratovolcanoes. With more than 150 miles of hiking trails, opportunities for exploration at Lassen seem endless. The park’s trails range from easy to moderate to strenuous — so there really is something for everyone. The Manzanita Lake Trailis an easy mile-and-a-half round-trip trail in the North Park Road region. Visitors should allot one to two hours for this gentle trails that winds around the lake. Those who cannot hike difficult terrain or those with small children will like this trail. The trail is shaded by Jeffrey pines and willow trees, making it a great choice for a hot day. Don’t miss the stunning views on the Lassen Peak and Chaos Crags trails. Wildlife sightings commonly include ducklings, geese, muskrats and beaver. Exploring the park’s hydrothermal areas is a great way to learn about the park’s inner-workings. Here, visitors will encounter fissures in the earth’s surface where geothermal vapors escape, bubbling mud pots, and pools of boiling water. The largest concentration of thermals in the park can be found at Bumpass Hell, named after an early settler who severely burned his leg after falling into a boiling pool. While the Bumpass Hell trail is not particularly tough, it’s high altitude — 8,000 feet — adds an extra challenge. The area is a collage of beautiful colors. — yellows, browns, deep sky blues and aquamarine fill wide basins. The park is open year-round and accessible 24 hours a day. If traveling during the winter months, guests should be sure to check the road conditions, as closures routinely occur due to snow. The Kohm Yah-mah-nee Visitor Center, located near the southwest entrance, is the only visitor facility thats open all year. It features a dining area, cafe, summer patio and gift shop. Near the northwest entrance is the historic Loomis Museum, where visitors can learn about the Lassen Volcano’s most recent eruption. The park has eight campgrounds. Half of the campgrounds can be reserved, and the other half are first-come, first-serve. All the sites have food storage boxes, metal grills and dump stations. Prices start at $10 per night. Camping cabins are also available and can be reserved at the Manzanita Lake Camper Store. The camper store also rents kayaks and is the location of the only gas station in the park. With a variety of habitats, Lassen National Park is rich with wildlife. A species that can be found in all altitudes of the park is the California tortoiseshell butterfly. The species is well-known for its population explosions, which are most likely driven by destruction of habitat and the butterflies’ migration to areas with more food. These orange and brown beauties are commonly spotted by the thousands on the top of Lassen Peak. The strong wind currents sweep the lightweight flutterers to the peaks of mountains. The butterflies’ mass movements can sometimes make driving conditions hazardous. Dead butterflies can pile up on roads and obstruct windshields. With cold temperatures and extreme winter weather, the Lassen area is not suitable for year-round living. However, the area was believed to be a meeting spot for at least four Indian tribes during the warmer months: the Atsugewi, Yana, Yahi and Maidu. It wasn’t until the California Gold Rush in the mid-19th century that American settlers arrived in the area. William Nobles and Peter Lassen, westbound pioneers, discovered an alternate route to California through Lassen. The park is named for Peter Lassen, who with Nobles, forged two routes through the mountainous area to California. Lassen took a liking to the area and lived there for a decade and a half until his death. He operated his own ranch, and tried to establish a city by attempting to attract industries like mining and timbering. None of those businesses really took hold, and the land became federally protected relatively early in its history. One positive aspect of Lassen’s failed attempt to civilize the wilderness was that the area was saved the destruction of rampant logging. In 1907, Theodore Roosevelt declared Lassen Peak and Cinder Cone U.S. National Monuments. Interest was low until the volcanic eruptions of 1914 and 1915 got the public’s attention. Lassen Volcanic National Park was established shortly afterward, in 1916. 1889 – Peter Lassen is murdered while on a silver-prospecting journey to Virginia City, Nevada. His murder remains a mystery. 1907 – Theodore Roosevelt establishes the area as a National Monument. May 30, 1914 – Lassen Volcano, thought to be extinct, erupts. May 19, 1915 – Lassen Volcano erupts again, shooting fiery red lava. August 9, 1916 – President Wilson establishes Lassen Volcanic National Park. Click to see a detailed Lassen Volcanic National Park map.